The Holistic Facial goes beyond skin deep and embraces beauty rooted in wellness. Experience the best in holistic skincare with proven botanicals and clean cosmeceuticals for a healthy, radiant complexion. 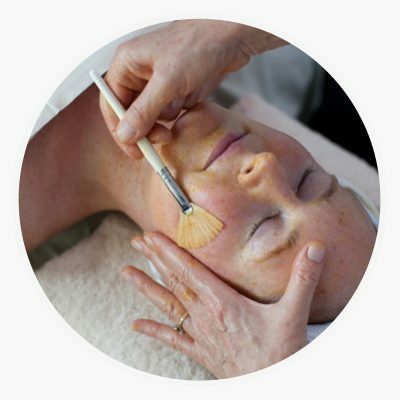 Your facial will begin with a detailed sculpting massage with probiotic Manuka Honey Cleansing Balm followed by a luxurious lymphatic brushing to release facial tension, improve blood flow and nourish your skin’s microbiome. After analyzing your skin, our highly skilled esthetician will customize your Anti-Aging Holistic Facial with a series of targeted treatments, including exfoliation and extractions. A healthy microbiome protects against environmental pollution and reduces inflammation, so think of it as your skin’s first line of defense that must be nurtured.. Helps promote a healthy skin microbiome with moisturizing Manuka Honey. Features Royal Jelly Peptides to nourish and reinforce the skin barrier. An ultra-soft facial cleansing brush that uses nylon bristles to gently sweep away impurities. This brush was specifically made to stimulate lymphatic flow for a smooth, radiant complexion. Made from the probiotic culture of Kombucha. The bio-cellulose sheet mask nourishes the skin microbiome, optimizes pH levels and fortifies the skin barrier. Your skin will look and feel instantly healthier and more radiant. Consistency is the most important step for beautiful skin. Monthly Anti-Aging Holistic Facials allow your esthetician to give you the results you want, faster. Facials also offer deeper cleansing, enhanced exfoliation, and specialized protocols to accelerate cell turnover. Monthly facials will also help your skin care products to penetrate more effectively to promote healthy, radiant skin.